I was thumbing through some scraps of pretty papers and couldn’t resist.. I’ve also really wanted to use this thistle stamp. I’ve had it for months and never even stamped it to test it out. I like how there’s writing on the paper, and writing on the stamp that’s different enough to still work. 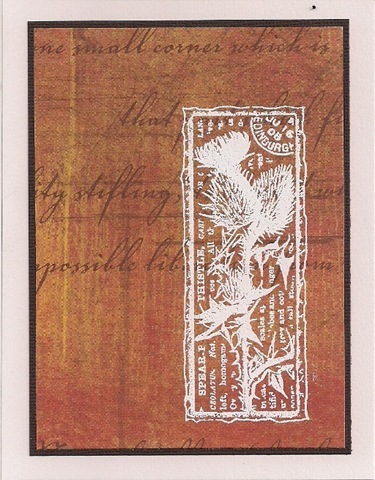 This entry was posted in Any Occasion, birthday, thank you, Thinking of you and tagged collage, embossing, orange, thistle. Bookmark the permalink.